Automate your Salesforce document generation. 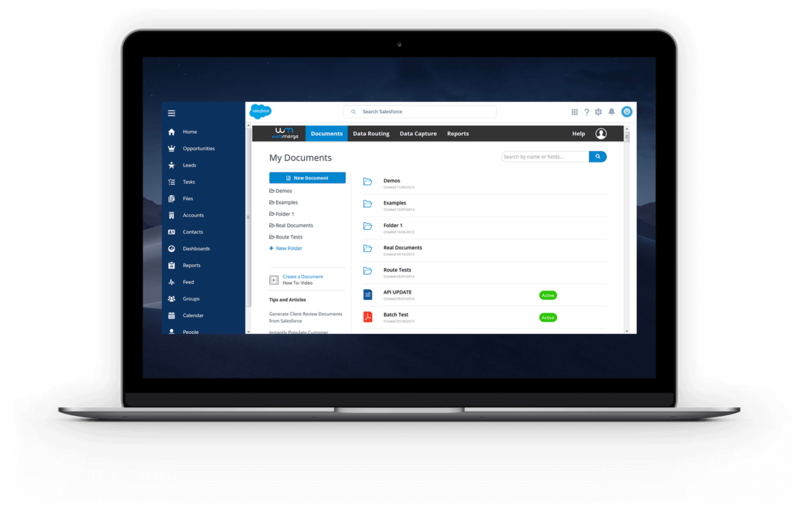 Generate dynamic proposals, contracts, invoices, reports, and more with your Salesforce data. Seamlessly merge your Salesforce data into custom PDFs, Word documents, Excel sheets, PowerPoint presentations, and more. The WebMerge for Salesforce package is available for Group, Professional, Enterprise, Unlimited, Developer, and Performance editions. Set up triggers that will generate documents automatically and send them to different places when certain pre-defined conditions are met. Whether you need to send docs via email, save them in the cloud, or route them to a third-party app, the possibilities are endless. At a conference or out in the field? Use the Salesforce Mobile app to easily access your files no matter where you are. Generate documents on the fly with the click of a button or manage your workflow settings–all from the comfort of your mobile phone or tablet. Personalize your contracts, proposals, and more by revealing or hiding different sections in your document. Use our open API to create your own custom integrations with apps both inside and outside of Salesforce. Adaptive Mobile Security Limited used WebMerge and Salesforce to process pricing quotes in only 2-3 minutes and save hundreds of hours of staff time. Create your first document free. Take WebMerge's Salesforce document generation solution for a test drive by starting a free trial.